Someone will always think that you need to be at their event. There’s some truth to it. You, however, only have so many hours in the day. Pick the ones that matter most. Where will you help someone else? If you start with that in mind you’ll be far less nervous, and far less overbooked! You do need to be in real clothes, business attire, and representing a business not just a bicep. When you can do that and show you are articulate, understanding, sharp, confident, and good-natured, the people who hang out in business attire most of the time will let you in. In your comfort zone they’re fish out of water. Yet, your comfort and confidence because of your physical comfort in your own skin is usually not such a challenge. 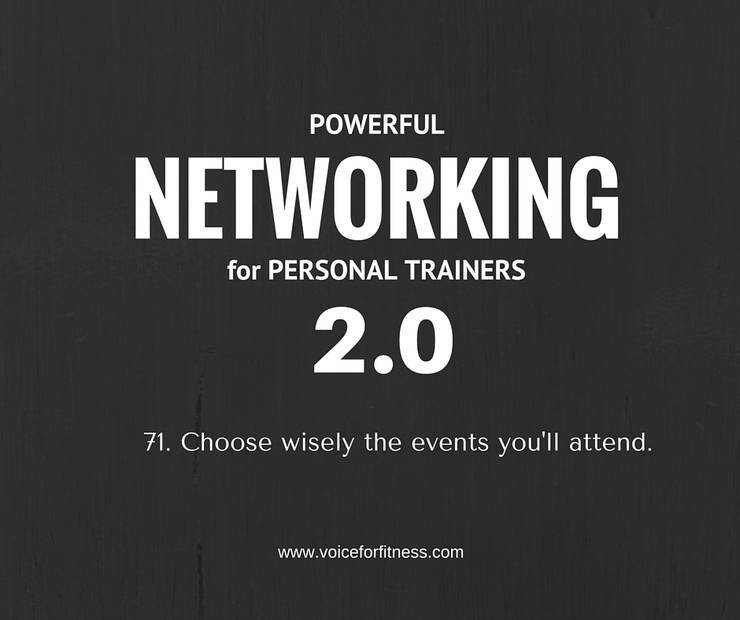 If it is, consider a coach – like you would expect a trainer to be a solution for a business person needing fitness – a coach can help you overcome feeling publicly awkward or intimidated. 1. Make it about them. Remind yourself that when you’re nervous, its because you’re still thinking about you, making it about you and what people will think about you. Focus on you going in order to help others. Ask, in fact. How can I help you? I don’t mean with the intention of showing them a core exercise, or a stretch for their aching hip right there on the cocktail floor. Ask how, in business you might collaborate. How could you bring your services in and give a motivating talk about reaching goals and having energy? Could you partner with a promotion that’s good for them and for you? Could you invite their team in for a special month of contests internally where they depend on each other with the end goal being relying on each other in a way that enhances communication and the emotional environment? 2. Go to learn and listen. If you go and talk as if you’re the expert you alienate more than associate. Focus on asking great questions and listening to the answer. Go beyond, what do you do? Ask, how did you get drawn into this work and mission? What’s your most memorable story about working with someone (doing what you do)? You will take the perceived heat off you and you’ll learn a ton about the people in front of you. You’ll identify those you want to work with more, feel comfortable referring to and those you don’t. Be prepared to answer the same questions you ask. They may come back around to you.